What an amazing time the last 10 years have been. I want to take some time today and share why it might matter to you that I have gone from Program Director, to Executive Director, to CEO, to Founder, and finally to the first Teen Life Team member to resign. You see, none of those roles have been easy, and my guess is there are things in your life that are not easy either. I hope that sharing from my story over the last decade will encourage you to stick with what is in front of you. 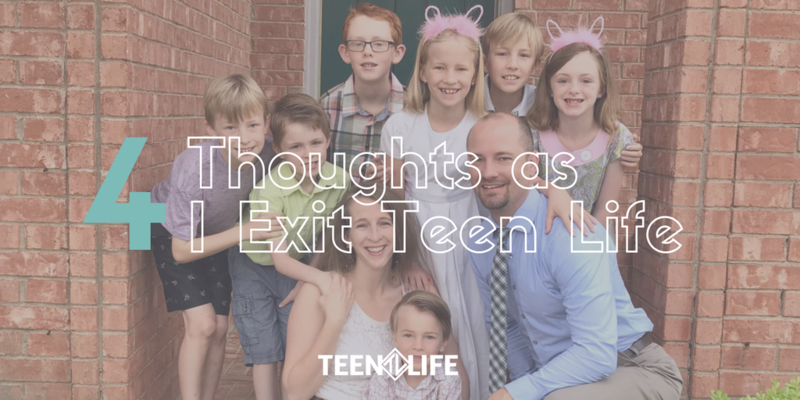 I am excited and sad about my transition away from Teen Life as Founder, but I am also thankful since I do not believe this will be my last connection to Teen Life. The reason for that is I think I will be able to use the skills I have learned at Teen Life wherever I go next, and I will use the principles that helped me learn those skills and tools to learn new, and even better ones, down the road. That said, here is a behind the curtain look at what I have gone through since beginning Teen Life in 2008. This job was not my first choice. I have shared with some of you that when Teen Life started I was reluctant. It was new, I thought I still wanted to be a youth pastor, and I felt this new opportunity had been forced on me. I even went and interviewed at a couple of churches in the first 2 years we were getting started. What I can tell you nearly 10 years later is I fully believe that Teen Life was the right path for me. Not only for me but for the teenagers we have learned how to help. I believe that what changed was my ability to feel one way and act another, learning along the way how to adapt and make the necessary changes to build and grow an organization. I feared failure was inevitable. When we began offering groups, one school invited us onto their campus. We had an amazing opportunity to be in the classroom with students who needed our services. I knew we were making an impact and the students voiced that too. The problem was I was afraid that schools would not keep inviting us. I figured one school was kind enough to give us a try but that other schools would not be as inviting. I was very wrong, and it turns out my fear of failure was part of the problem. Not that I shouldn’t be afraid, but that if I had been more willing to try things early on we might be further down the road now. Thankfully, we have overcome that deficit, and this school year we have trained people who are working with over 1,000 students in 17 school districts and 3 states with 14 people being trained in Tennessee next week! Trust is greater than suspicion. I started reading a book recently that put this phrase in my mind. In Virtual Culture by Bryan Miles, he talks about how people want to be trusted. I want to be trusted, and I am sure you do too. The fact is I have learned a lot about how trust is a big part of an organization’s success. The ability to trust our volunteers is a necessary decision to help us effectively work with more students every school year. The trust that we have that schools will tell us how we are doing, along with the trust that the people I have invited to be part of the Teen Life team are going to do their job is a weight that is sometimes hard to carry. But it is worth it when you are pouring yourself into something so meaningful. Continuing to learn is required. Read, listen to podcasts, prioritize conferences! These things are key to successfully replenishing and expanding our thinking to progress whatever task or project we have in front of us. I have learned so much from Donald Miller, Michael Hyatt, Ken Coleman & Rory Vaden. These virtual mentors have helped me grow and develop the skills needed to create the structure that will sustain the Teen Life organization after I am gone. I wish I had been introduced to these godly, intelligent men sooner. With those lessons in mind, I want to close my time with Teen Life with this. Supporters and friends, there is a bright future ahead for this organization. Chris Robey, Karlie Duke, Beth Nichols & Stevie Stevens all are doing a great job and will continue to as they stay laser-focused on how to equip, encourage, and empower teenagers to live life better. Your continued support of this team, our volunteers, this organization and your local school is vital to this success. I would urge you to ramp up your support. Become a trained volunteer, tell your local school, donate through our Teen Life Gives Back fundraiser going on now, pray that we continue to provide services that teenagers need and schools can’t live without. Thank you all for your amazing support these past 10 years. I cannot wait to see what the future holds for Teen Life! Ricky Lewis is our Founder and former CEO and has been with Teen Life since the beginning. As a father of 7, he seeks to help parents and their kids Live Life Better. Your contribution to Teen Life is an example of following God’s will not our own. May He bless you and your family as He leads you to new pastures.